So you’re considering metal roof installation for your commercial business in Central Alberta. Whether you’re planning for new construction or re-roofing of an existing property, the decision to go with a steel/metal roof over traditional materials (asphalt or wood shingles, etc.) is a wise one to make, no matter how you shake it (that’s a pun, for the initiated). The provincial climate presents a direct challenge to the health of commercial properties. We’re susceptible to extreme wind storms (tornadoes even), summertime forest/prairie fires, and wintertime freezing temperatures with heavy snowfall that can add a massive amount of weight your business’ rooftop. Traditional roofing materials such as wood shingles are vulnerable not only to impact damage from high winds and debris, they can dry out, crack, and curl through the passing of the seasons. Even concrete tile roofs experience problems with the frequent freeze/thaw cycles of Alberta. When it comes to fires, wood shingles will go up in flames. Class A asphalt shingles are able to withstand burning through the wooden structural components for up to two hours, but after that all bets are off. Metal roofing on the other hand, is fire resistant. The summer months deliver other less dramatic no less impactful threats to asphalt (and other roofing). Because these materials are made of oil impregnated paper or fiberglass, they begin to deteriorate from the moment they are installed due to the sun’s UV-rays. Metal roofing on the other hand will not decompose under the stress of UV or other weather-borne conditions. Simply put, traditional commercial roofing materials simply cannot hold up to the resilient nature of steel/metal roofing products and installation. Wood and asphalt roofing does not hold up to the insulating properties of high-quality metal roofing. When you factor in the deteriorating nature of wood and asphalt shingles, the ability of harsh cold and heat to enter your shop, establishment, or office becomes greater though the years. Because of this, heating and cooling energy usage is more than it would be compared to that of metal roofing. Metal roofing will provide a more comfortable all-season environment for customers, clients, and staff (as applicable) while keeping utility costs down. Environmental impact studies show that up to an estimated 20 billion pounds of asphalt shingles are dumped into US/Canada landfills every year. Then there’s wood shingles/shakes, which put a strain on national lumber resources. Metal roofing is a far better solution for businesses seeking a more eco-conscious roofing solution, whether for altruistic reasons or for keeping up with provincial building codes that better address sustainable building practices. Building with the environment in mind is also great for public relations (become LEED certified) which can help attract positive media attention and more customers/clients, which in the end speaks favourably for your bottom line. When you first hear the words “metal roofing” you may conjure up an image of a bland rooftop more appropriate to an industrial park. That may have been the case twenty years ago. But today, metal roofing technology has made it so that your commercial roof will shine bright and beautiful. Metal roofing can be made to mimic cedar shake or any other type of wood gradient. Panels can be designed to mirror the aesthetic of practically any slate, tile, and shingle and can be painted in any colour so that your commercial brand image is not only protected, but accentuated. Commercial architects and designers all over the country and province are singing the praises of metal roof construction because of the flexibility that it affords them. The durable (item #1), insulating (item #2), and sustainable (item #3) properties of metal roofing noted above have a real, direct, and positive impact on the longterm cost of ownership of your commercial building. While a metal roof may cost more (this is contingent) than some traditional shingles in the beginning, an ROI becomes evident soon after installation. This dedication to building a sturdier and safer building can also get you better insurance rates in Alberta, reducing the annual premiums you need to pay. 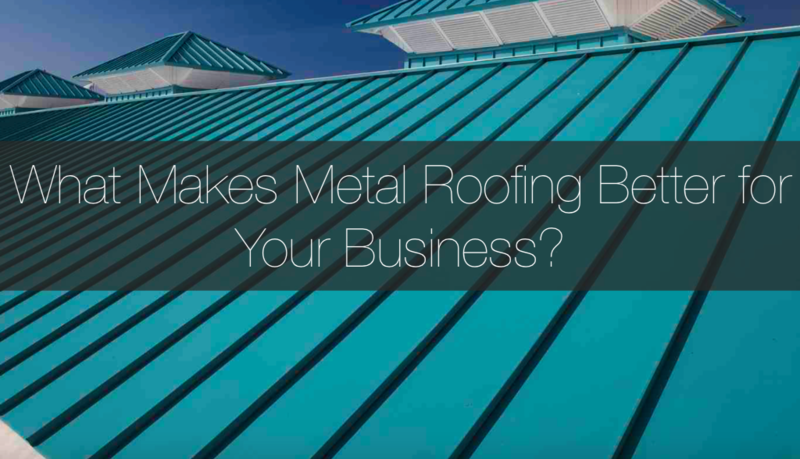 As a business, you know that it is wise to make an initial investment so that you reap the financial rewards in the long run and thus opting for metal roofing is one of a few key decisions that you will make that will deliver exactly that. If you’re ready to make the right decision regarding your roof or re-roofing installation and your commercial business is located in Central Alberta, you can learn more here or by contacting Apple Building Systems Inc today. ...Because Building Should Be Simple.